The flawless balance that is visible in this universe is a proof that shines like the sun affirming that it was God Almighty who established this universe. Every being in this universe including microorganisms, plants, animals, etc wants to invade the earth. However, their inclinations and desires are prevented by an obstacle of some power, and each one is unable to pass a certain limit. For example, microorganisms can rapidly proliferate in proper conditions. If those microorganisms were to proliferate as they wished, they would be able to invade this world on their own. Nevertheless, the microorganism has not been given permission to do this so that the rights of other life forms can be protected. To prevent its invasion, the microorganism has been forced to contend with various enemies. Some restrictions have been introduced for millions of fish in the sea that lay eggs. If a limitation was not introduced, then every species of fish would invade the seas with its own kind and the balance would be destroyed. For example, in one year, a lobster can lay 7 million eggs. If all of them were to be lobsters, then within a few years, the seas would be swarming with them. A whiting fish lays 6 million eggs per year. If all whiting fish were to live, then, the seas would be overflowing with whiting in less than a year. However, only one dozen of those whiting fish are able to survive as the rest become bait for other fish. If fish and other sea creatures could proliferate as they wanted, then, within one year, three out of four seas would be swarming with sea creatures, and it is probably not difficult to forecast that there would be an incursion of seawater on land. However, there is no allowance for this and the seas are maintained at a perfect balance. It has been determined that a species of house mice has the potential of reaching 400 in numbers in one year and 65,000 within two years. If the reproduction and proliferation of mice were not prevented, then, within two years, the entire earth would be covered by mice of two spans high. What do we say about the oxygen balance in the atmosphere of the earth? The atmosphere contains 21% oxygen, 77% nitrogen, and 2% other gases. If the proportion of oxygen was a little over 21%, then the world could easily burn if you were to light a match to turn on the oven. And if it was less than 21%, then we would be breathless as if somebody wrapped a rope around our necks. It is possible to increase examples and to write a book about the balance in the universe. Besides, every scientific topic is related to it and every science is a loyal witness to the existence of this balance. We refer the billions of other examples that are related to the universe’s balance to science books. 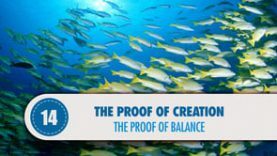 We now ask the person who dares to deny God: Is it possible that a precise balance like this has evolved through a coincidence and that it has continued to coincidentally develop for billions of years? If it is not possible, then who established the universe’s fascinating balance? Who is preventing the predisposition of the creatures to invade the universe and is intercepting their universal incursion? We say God is. How about you? What do you say?